A classic Nova synth, drum machine and sample sequencer, combined in a standalone groove box. Love the Novation Circuit! This little box is so versatile. We use it mostly as a midi controller for softsynths; the knobs are smooth and map easily. The pads are smooth and responsive to several layers of velocity. There is nothing quite like the Circuit, and we have looked. Fantastic and easy to use product, I had ideas flowing literally in minutes. Great connectivity means it can also connect to outboard midi gear and become the heart of a DAWless set up! Love it! A killer groove box, really easy to use. Fuels your creativity and doesn't get in the way of your ideas. Great product! I've wanted to own something like this for awhile. It could use a few minor improvements and I would love to see the firmware Open Sourced (although that's probably hoping for too much) since it has a lot of potential that developers like myself would love to leverage. Totally worth 5 stars! Amazing groovebox, I play with this on a daily basis. Great sounds, intuitive interface, and even the online interface is nice and easy to use, you really nailed it, Novation. Though I don't know if it's the drivers or what, but its MIDI isn't nearly as responsive as a lot of your other controllers. Getting past that, this has to be one of my favorite products of yours out there. Great product, easy to make beats in seconds. Download the latest user guide from the website to get up and running quickly. Bought as a gift. Worth it. Still dont know how to use properly. So far it's a lot of fun. I know it's very powerful and looking forward to master the circuit. I was up in running in 3 sec. The item is very cool, but stopped functioning after only four months of light use. Every time I press play the groove box shuts down. I've tried it with batteries and the adapter, same results both times. I intend to try to get my money back, or at least exchange it. Novation Circuit is always on my production desk. From the start it was fun and inspiring, and recent expansions and updates have turned it into a must have tool. It integrates well with my novation hardware and Ableton software. This a brilliant piece of gear. I think "Circuit" lives up to its name. It's a standalone synthesizer, sequencer, and drum machine. It's got a built-in speaker, but with some headphones plugged in you've got a powerful instrument that you can take anywhere, jam anytime. But, route Circuit into Ableton, and you've got all of the additional sound morphing FX and the like, along with Isotonik's Circuit Synth Editor, which gives you full control over the synth parameters, allowing you to get really deep with your sonic creations. Or, with Circuit hooked up to the web, you've got Novation's Circuit Components, which allows you to upload your custom patches for safekeeping or sharing. Novation has updated Circuit several times since its release, with new features like the ability to upload your own samples, being added along the way. At the price point, there's no better groovebox out there! The workflow on this box is a joy to use: I have the Circuit as part of my live improv electronic rig - and the interface is so good I can work with live while I'm playing doing things I'd never do on the computer live. And while it is a serious peice of professional gear, I recently gave a 12 year his first lesson in electronic music with it. He produced his first track - with him in control of the unit - in under 2 hours. It's that easy to learn! Fun music source. Can't wait to master all the possibilities. Small but big on how much it can do. Awesome for sequencing, and I like the pretty lights. Sturdy construction, well conceived. As a bonus runs off batteries for portable use. Novation has made major upgrades. good support. All around excellent! I bought the Circuit before Components or the synth editor. I thought it was great then just with the factory presets, now it's amazing! I've made a personal goal to fill it up with 128 of my own sounds. I play with this thing almost everyday. It really makes new ideas easy to come by and develop. I kinda want a second one. BUY ONE! I've had my Circuit for about two months now and initially purchased it as a way to work on song ideas while I'm away from the studio. I take it into coffee bars or on flights when I travel, and it helps me keep the creativity flowing. The newly-added features to be able to swap in my own samples and access to the synth engines really sealed the deal for me. In the studio, it's really easy to export the MIDI data into Ableton Live so I can expand on my ideas, and I've been experimenting with integrating it with my Eurorack modular with a MIDI-to-CV converter. I just recently figured out (duh!) that I can plug my 61-key MIDI controller into it which makes it even easier for me to play in those 6-voice synth parts. The Circuit has made it easy for me to take my creativity on the run, with robust features (love the FX chain) and an intuitive interface. In the studio, it's expanding the controls and interfaces I can use to create music. I just love this thing. I am still getting familiar with the Circuit. I think it is an excellent instrument. Very fun to use, and with the new Components makes it even more useful. Love it! Works great! Going online to edit wasn't a good idea. That's like giving your ideas away. So I can't enjoy the editing. What if I don't want u to see what I'm doing. Are u the gov?!?! Lol u should change that! My first foray into a digital music machine that wasn't a keyboard or a computer. I've really had fun with this straightforward approach to making a project. I'm definitely still learning how best to use it, but I've enjoyed exploring the deep possibilities circuit offers and the fact that Novation has been working to add functionality to this product even after I bought it. Plus, the ability to grab Circuit and use it anywhere is a great feature. Beginners looking for plenty of options with a logical control scheme look no further! With just a couple of firmware tweaks this amazing wee box could be the greatest thing since sliced bread. Great piece of kit, its intuitive, its inspirational and above all its great fun to use and explore its capabilities! Just a beautiful piece of kit. Intuitive and fantastically tweakable. I can't switch this on without capturing at least a couple of ideas. Whilst the base model was great, the new firmware and Circuit Components open it up to fantastic levels of customization. Now with the synth editor, you can delve in and create your own patches. Sometimes the stock patches can sound a smidge "clean" so it's a godsend to be able to edit them or replace them with your own. Of course the ability to replace the samples is fantastic also. It's a great little box to take to work / on trips etc. You won't find anything anywhere near as inspiring for the money. Innovative, easy to use and great fun. I love my circuit. This little guy is packed with possibility. It comes with two very easily twicked nova synths that beg to be sequenced. That Easily side chain to its built in four track beat machine. Once you plug it in to a louder PA, you really get to appreciate the quality of the stock sounds! The built in speaker is a cute and welcome concept, but hardly has any real world use as it doesnt express the true sounds of the device. Along with the external sound editing and sample librarian, novation offers a free online storage to backup all your work. Brilliant. oh and it can run off batteries! Great bit of kit. Got me and my kids back into making music. It is a great toy fun and easy to play but loads of depth if you want to take it further. Don't get your Kids piano lessons get them one of these.. get yourself one too! Everyone should have a Circuit.. very accessible deep instrument nice one novation. keep up the good work! happy customer here! Every manufacturer claims that their product is intuitive to use. That word is so overused. After having owned hardware synths, groove boxes, controllers and such, only one box I have, that is truly intuitive is the Circuit. Nothing to read, no menus, just a simple workflow. I use it as a standalone, outside on a hot summer night with headphones. Or as a sequencer for my Volcas. I use it almost everyday. The Components editors and sample transfers are awesome too. I customize my box whenever I want fresh sounds. I just love this product. Not the gadget for me. To me it feels very limited on patterns and sounds, and mostly dated sounds at that. The fun in spinning filter knobs wears thin out after about 5 mins and I yearn for something fresh and inspirational but I can't find it (and I have explored ALL it can do). Everything ends up sounding very similar, and I desperately want to break free of its pattern-based and sonic shackles, but without midi there's not a lot else it can do. It just isn't the gadget to set my world on fire. I wish it were a different story, but I'm very disappointed after all the launch hype. So, my Circuit is in the departure lounge. Perhaps its next owner will love it more. nova engine sounds great - editor makes all the difference - I use it for ambient soundscapes as well as for key/bass sounds sample editor is a lot of fun I loaded mine up with chiptune and ethnic percussion. It wasn't very broad...at first. Then novation updated and added multiple extra features. Now it's like a mini hardware based Ableton. All updates run flawlessly. It's hard to encompass all the personal possibilities. Customers should view the excellent novation web tutorials on the various features. Then you can understand that this tool can be set up for many things. Highly customizable. Highly fun. Very portable. Very reliable. I'm a musician who plays drums, guitar, and keys. Love performing and improvising with other musicians. The Circuit fits into that style really well. I can manipulate and move through pieces of music while improvising them, it's a good experience! Very simple to use and integrates with a studio easily. Really need the editor to get the most out of the internal synths but is also very good for sequencing external gear to, the scale option is good if like me you are not very good at playing instruments and mainly program. For the price the synths sound quite good and very programmable. So worth it. Sounds great out the box, solid tactile feel and design and easy to use; and the fact that it's stand alone and not another controller could mark the return of groove box culture. Should society not blow itself up, this could prove to be a memorial peace of gear. I am just getting to know this instrument but so far have found it intuitive and inspiring. There is a lot more depth to be found and I look forward to the exploration. As a mobile scratchpad, it is unmatched and is helping me get my ideas out faster than ever before. If your somebody that likes to knock out a quick melody in a minimalist style then this machine will take you there quick.And a lot of people will use it purely for that reason.Theres enough functions there to keep somebody new to music happy and for an introduction for children this thing could be really inspiring.Personally i would have been happy to pay more for a screen,more tracks,and triplet and real sampling functionality.But that comes at a price.But in all honesty for a seasoned pro its just too little but for a newcomer more than a enough.. If you're looking for an easy-to-learn, easy-to-use production tool, look no further. Deep levels of potential here, lots of great synth sounds, multiple sequence chaining, great drum sounds, super levels of customizability, all in something powered by 6 trip-a's that'll fit in your backpack. If you're a producer who wants a portable joint to knock out some new ideas, or a newbie who wants an easy-to-learn tool to start bustin' out beats, this be yer boy. I think it's a great product, but sadly the limitation in the number and type of voices meant that I returned it after a couple of weeks, and traded it in for a Korg Electribe. However there are things that I miss from the Novation namely: - Interface. overall, the UX/UI of the Novation is excellent. I picked it up in a few hours, and was instantly comfortable with it. On the other hand, the Electribe feels like programming a VCR rather than jamming on an instrument. - Sequencer. The circuit's sequencer in both live and step mode is a joy to use compared to the Electribe, which is pretty much impossible to use in step mode. - Effects. The Novation has a real volume and send control for each channel instead of the dry volume or wet volume approach of the Electribe. On the other end, the number of type of effects is really small. - Voices. At least for the type of music I make, I found that the rigidity of the 2 synth + 4 sample approach really limiting. - Encoders. The Circuit's infinite and relative encoders are great when switching between voices, since they always represent ground truth. The Electribe is much harder to use, even in catch mode, since you can't tell what the current value is without trying to change it. After working with both, my ideal GrooveBox would have the interface of the Novation, but with the number of tracks and voices of the Electribe. Even just support for additional midi-only tracks in the sequencer which would drive external sound modules would have made the Circuit flexible enough for me to keep. i returned it. my experience with it sucked because the manual was useless. I've had my Circuit for two weeks, and I love it. My daily life is busy, don't have a ton of time for music, so I wanted something without a steep learning curve. Circuit does that well, I was making sounds within seconds, and patterns and loops within minutes. The portability can't be overstated, it's great. On board sounds are good, but the real fun is the tweak able parameters for each. I'd recommend it to anyone, especially given the price. If it was stolen I'd buy it again. Bought the Circuit in early 2016 as I wanted a great multi-track sequencer that was particularly suited for live jamming at home. I was a bit hesitant as I've never used any pad-based gear (MPC, Launchpad, etc.) other than the Arturia Beatsep, which I found too limiting. I have a load of keyboard and desktop synths, and tend to use a small combination of them at a time while working on a tune. The Circuit specs were appealing, but I wasn't convinced I could get the hang of something with no display, no labels and so on. I also had never purchased a Novation synth or controller. 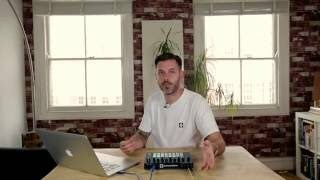 I was comparing the Circuit to the Electribe and the Beatstep Pro. In the end, I felt the Electribe sequences would be much too short and limiting, and I wasn't convinced that the BSP had yet overcome its initial growing pains. Also, the Circuit's ability to use *chords* (not just notes) in its sequences was really appealing. I went ahead and got the Circuit, which also seemed to have a significant advantage in features for the price. What a great choice that was! The Novation Circuit has easily been the best sub-$500 gear investment I've made in the past year. Although I bought it primarily for sequencing and as a "sketch pad", the onboard synth sounds are really quite good, and the drums more than meet my needs. It's not a TR-8 out of the box, but it has that potential. Components are solid, documentation (PDF) is extremely clear, complete and well-written (thank you!) and, despite the interface being like nothing I've ever used before, I got the hang of it in no time. And it is FUN! And as a sequencer, it is absolutely tight and easy, very easy, to use. Biggest plus: shortly after I purchased it, some massive updates were released that actually extended the features of the Circuit a great deal: webMIDI based interfaces for updating the Circuit and its patches; a wonderful wide and deep patch editor (desktop), and; the ability to load your own samples! Don't like the drum patches? Swap them out for your own! Simply amazing. After 5 months with the Circuit, I can't imagine ever letting go of it. It's not only a great piece of gear on its own, but it's been instrumental (ha!) in getting so much more out of the other gear I connect to it. I can't think of anything else like it on the market right now in terms of value and innovation. Circuit can provide MIDI Input and Output via USB to a connected computer. It is class compliant, so will work on any modern Mac or Windows PC. Circuit will also work as a standard USB-MIDI controller. Make new electronic music quickly and easily with a standalone groove box that combines Nova-heritage synths with expertly sculpted drums. Or your samples. Circuit is designed to inspire. Two Novation polysynths and a four-part drum machine, combined with an intuitive grid-based sequencer in a standalone box that will have you making electronic music in minutes. Hit some pads, tweak the knobs and your track will start to emerge, all locked in time and key. Customise the two Nova-heritage synths and add your samples to make it your own unique instrument. Then play around with effects, patterns and sounds in real time, to produce your track. Compact and battery powered with a convenient built-in speaker, Circuit can be used to make music entirely on its own. In the studio it will work alongside your standalone synth gear and run in sync with your music software too. In short, it's all you need to inspire, create and play new tunes. Circuit inspires, straight out the box. It combines a 2-part synthesiser and a 4-part drum machine with a 4x8 RGB velocity-sensitive grid sequencer, which will have you finding new musical directions and creating electronic grooves in no time. Compact and battery-powered, Circuit truly stands alone. You can create entire tunes from scratch without a laptop, then save them and play them back live. You don't even need speakers, because it has a one built in. Of course, Circuit will plug in to your sound system and work with your computer and other synth gear too, via its Line outputs, USB and MIDI ports. Building on our true Nova heritage, Circuit delivers cutting-edge sound with production-ready monophonic and polyphonic patches and tons of character for easily creating deep bass lines, epic leads and warm pads. Embrace a new way to make music. Circuit's split grid shows your steps and notes at the same time, so you can sequence and play while seeing exactly what's going on. Build up your parts quickly and easily, either by programming each step or capturing your performance in real-time. Use simple streamlined modes to keep your harmonies, rhythms and melodies locked in time and key while you make riffs, hooks and chords. Or start experimenting for some serious sequencing exploration. A suite of tools that expands Circuit, and gives you all you need to design and customise your instrument. Simply drag and drop samples onto Circuit with Sample Import, using the streamlined browser-based Web MIDI workflow, and create your own palette of sounds. Looking for the Perfect Beat? Velocity sensitive RGB pads let you quickly build expressive drum beats, by step sequencing or playing the wide range of drum sounds. Define your sound with total control over pitch, decay, distortion and EQ. Sculpt your sound using eight macro knobs allowing you to subtly tweak or completely transform each patch. Then add movement and rhythm by recording or sequencing your performance. Create an entire tune by combining up to 128 steps of synth and drum patterns, then adding space, depth and energy to your music with built-in effects. Sidechain your synths to the kick drum to get them to pump. When you're done, save your tune to one of 32 slots. 64-pad grid controller for Ableton Live, now with RGB LEDs that match the clips in your session view.